The latest resort-style 55+ community is on the rise in Delray Beach. 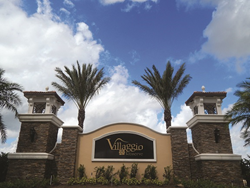 Recently, Villaggio Reserve has seen an increase in their popularity in Delray Beach. Not only are more people visiting the community, but they are buying homes as well. If people driving by Hagen-Ranch Road and Atlantic Avenue had the benefit of time-lapse photography spanning the past few months, they’d see the remarkable rise of Delray Beach’s latest 55+ resort-style community. They’d witness the grand entrance to Villaggio Reserve, once just the promise of open land, where today, the stone and landscaping create a dramatic presentation befitting this new residential destination. They’d marvel at the emergence of landscaping growing lush and unfolding beneath the nurturing South Florida sky. They’d see winding roadways and ornate lighting – all the ingredients of an architecturally refined and distinctive enclave. The grand gatehouse and tower are handcrafted of stone, masonry and metal work. Beyond there, the winding, European-style streets are lined and lit by attractive period street lights and way-finding signage that attest to the community’s timeless Spanish-Italian appeal. Throughout the Villaggio Reserve – from entrance and gatehouse to the streets and model residences – mature trees and palms have taken root. Their shade is growing full in the South Florida sun – the amenity many upscale buyers from across South Florida and the Northeast seek in their luxury Delray Beach residence. In fact, lush tropical landscaping is a hallmark throughout Villaggio Reserve. Rows of palms stretch from near Hagen-Ranch Road, past the gatehouse and along the entryway. The model homes enjoy the beauty and ecological benefits of landscaping that provides visual and environmental appeal. Rising nearby will be the Cabana Club Clubhouse, Villaggio Reserve’s 38,000-square-foot town square and lifestyle destination. It is there that residents and guests will enjoy daily living, from dining to activities and athletic pursuits. Billiards, cards or crafts in the multipurpose rooms, swimming in four pools, bocce ball and tennis on the lighted courts – the picture of life well lived will appear at the Cabana Club – and Villaggio Reserve. Residences at Villaggio Reserve are priced from $270,000 to $400,000. To see the emergence of Delray Beach’s next luxury lifestyle community, visit Villaggio Reserve on Hagen-Ranch Road and Atlantic Avenue or online at http://villaggioreserve.com/ or call today at (855) 230-0998. The Sales Center is open from 9:30 a.m. to 5:30 p.m. Monday through Sunday.